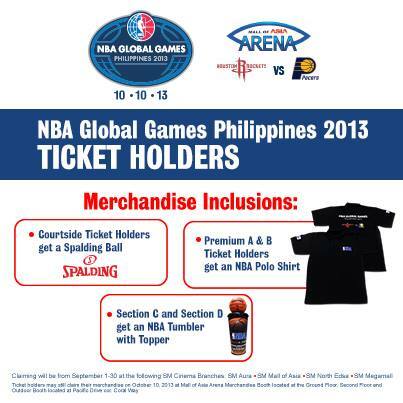 Manila - Mall of Asia Arena via it's Facebook page announces today that ticket holders to the upcoming NBA Global Games Philippines can start claiming their free official merchandise on September 1, 2013 at SM Cinemas located in SM Mall of Asia, SM Aura, SM Megamall, and SM North EDSA. Premier A and Premier B ticket holders may avail of their limited edition NBA Global Games T-shirts at designated merchandise booths in cinema lobbies of the four Premiere SM malls. Section C and D ticket holders will also be able to grab their NBA Global Games Tumblers with Toppers from the same branches. Fans may also purchase additional NBA Global Games Philippines items at the selected merchandise booths. Claiming of complimentary merchandise will last until September 30, 2013. Those who cannot avail of their official items by the end of September will have the chance to do so at Mall of Asia Arena on the day of the NBA Global Games Philippines. To get the full Mall of Asia Arena experience, ticket holders will also be entitled to free meals on the much awaited game day on October 10, 2013. The highly anticipated NBA Global Games Philippines will be held at the Mall of Asia Arena on October 10, 2013 at 7pm. The historical game will feature the most awaited match between Houston Rockets and Indiana Pacers (NBA pre-season game). With 90% of tickets sold, fans and avid basketball viewers are encouraged to purchase their tickets at SM Ticket booths located in Mall of Asia Arena and SM Cinema branches nationwide.